Twenty five years ago, Tim Brady started his career in metal fabricating as an applications engineer, focused on helping fabricators leverage technology to drive productivity and quality initiatives. Today he’s a product manager with Amada, specializing in CNC punch-press and tooling technology. We leveraged his background and industry experience to learn a few tips fabricators can use to optimize throughput and quality from their CNC punch presses. Tip one, says Brady: Focus on sequencing, and the order of tool selection. “Many of the programming software products on the market feature automatic optimization routines,” he notes, “yet not every shop uses them. There are two basic programming methods. The first is used to punch out an entire, single part in a nest of similar parts, continuing on to the remaining parts in the sheet. While this proves convenient for performing a first-piece inspection, it does not als result in the most efficient program. 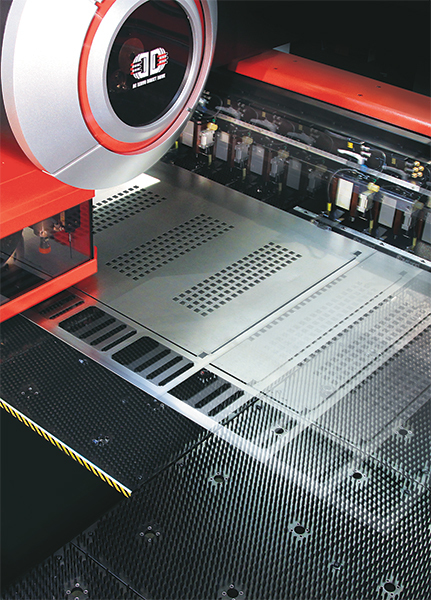 Best practice, when first-piece inspection is required: Use both programming methods, says Brady, so that the fabricator can perform a first-piece inspection and then switch to the optimized program to produce full sheets as quickly and efficiently as possible, minimizing tool changes and movement across the sheet. Accuracy and dimensional tolerances are a whole different ballgame, and Brady also has advice here. Nests made with wire joints (left) and parallelogram parting tool—the parallelogram tool (right) is a much safer option, as it allows the part to break completely from the nest with the parallelogram-shaped tab adhered to the skeleton. Often, the wire adheres to the part, endangering machine operators. Most fabricators understand the potential benefits from commonline punching—using a punching tool to simultaneously create, for example, the right edge of one part and left edge of another part. Material utilization climbs, as more parts, if not entire rows of parts, can be added to a sheet nest. Brady points out additional benefits of commonline punching, then explains why some fabricators have tried the technique and failed, fearful of trying again. Here’s how the bow-tie tool looks on a sheet nest. “When do metal fabricators struggle with commonline punching?” I asked Brady. “The reasons relate back to my previous directive regarding sequencing,” he notes. “Lack of sheet rigidity is the most common problem fabricators experience with commonline punching. So, develop programs that make the longest parting hits at the end of the job, and als work toward the clamps. The increasing part complexity emanating from many a product designer often leaves programmers scratching their heads, struggling to find the most efficient method to produce parts seemingly designed by engineers with no compassion for those required to fabricate them. Tricky contours make designers happy when it comes to shaving weight, eliminating downstream assembly operations or creating cosmetically attractive parts. But they can cause fabrication operations, including punch-press processing, to bog down. This special tool, for use in an auto-index station, is designed to create four different corner radii. One to keep up the speed as contours become more intricate is to use special-designed punching tools. Rather than program a nibbling tool to carve a complex path, or using a group of tools to punch an intricate or multifaceted profile, “investing in a special, custom tool can easily pay off in short notice,” Brady says. As an example of where this type of tool design might shine, Brady notes corner-radiusing operations. “Rather than use separate radius tools on parts requiring varying corner radii, why not design a tool that has a different radius on each corner?” he asks rhetorically. New tooling concepts developed in recent years aim to reduce or, in many cases, completely eliminate the need for secondary operations. Case in point, says Brady: fine-contouring tools, and tools for deburring and tapping. The fine-contouring tool nibbles at nearly 800 strokes/min., and makes contours unachievable with standard tools at pitches less than material thickness. This often results in a near-laser-quality edge. Fabricators leverage these capabilities, Brady says, to improve their ability to take on prototype work. Another off-the-shelf special tool of which Brady speaks fondly is a bow-tie tool—used not to eliminate secondary operations but rather to help fabricators avoid the use of dangerous wire joints. Wire joints, he notes, often find use to connect punched parts to the sheet until they can be released by the operator. One issue when using a bow-tie tool: The diamond may adhere to the part rather than the skeleton, requiring an operator to snap it off. As an alternative, fabricators can opt for a parallelogram tool, which allows the part to break completely from the nest with the parallelogram-shaped tab adhered to the skeleton. Of course, eliminating shaker parts altogether has become the mantra at many a sheetmetal fabricator, and automation is the to make it happen. Automated parts removal from the press table, particularly for fabricators cutting multiple nests of smaller parts, is becoming more common, says Brady, to augment automated sheet-load systems.